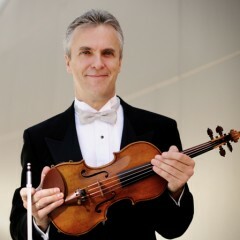 Chalifour began his orchestral career in 1984 as associate concertmaster of the Atlanta Symphony Orchestra, serving under the late Robert Shaw. He followed that term by occupying the same position with the Cleveland Orchestra, advancing to acting concertmaster, during Christoph von Dohnányi’s tenure as music director, before moving to Los Angeles. Throughout these years, he has simultaneously performed a vast repertory, more than 50 concertos, spanning the world as a soloist, sharing concert stages with such notable conductors as Pierre Boulez, Andrew Davis, Charles Dutoit, Christoph Eschenbach and Esa-Pekka Salonen. His travels have found Chalifour soloing with the Montréal Symphony Orchestra, the Queensland Symphony Orchestra (Brisbane, Australia), the Auckland Philharmonic Orchestra, and the Hong Kong Philharmonic Orchestra, among many others. Summertime performances have included concerts with the Sarasota Music Festival and the Mainly Mozart Festival in San Diego. During his Cleveland tenure, Chalifour was a founding member of two chamber ensembles, Myriad and the Cleveland Orchestra Piano Trio. His experiences as a chamber musician have included a notable series of concerts alongside the cellist Lynn Harrell at the Amelia Island Festival in Florida, and at the Madison Chamber Music Festival in Georgia. Chalifour has joined forces with two of his colleagues, Joanne Pearce Martin and Peter Stumpf, and formed the Los Angeles Philharmonic Piano Trio. Besides exploring the rich trio repertoire, the three performed Beethoven’s Triple Concerto in September 2005 at the Hollywood Bowl. Martin Chalifour graduated with honors from the Montréal Conservatory when just 18, and advanced his studies to the Curtis Institute of Music in Philadelphia. He returns to Canada regularly, including appearances at the Ottawa International Chamber Music Festival, and also back in his home province, Québec, where he maintains a teaching schedule, while also soloing with the Orchestre Symphonique de Québec.